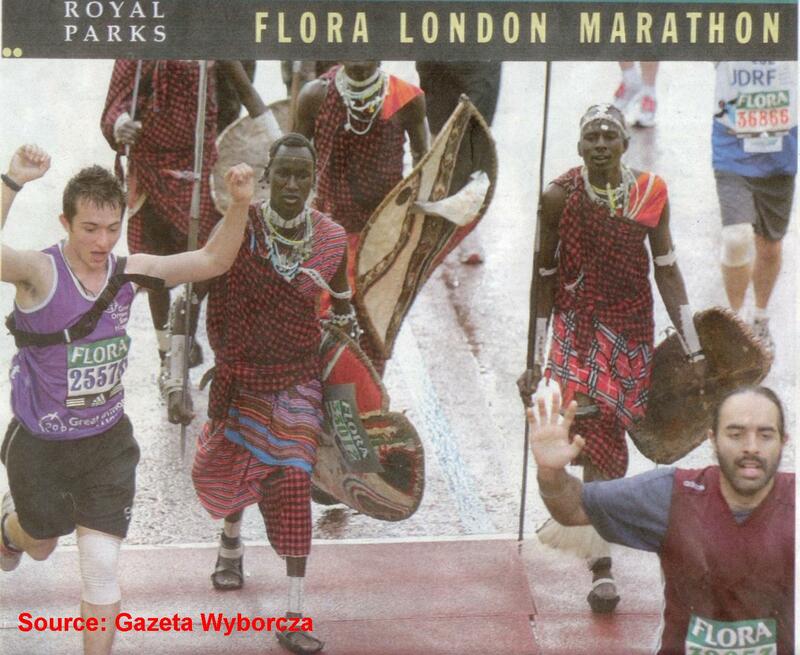 According to Gazeta Wyborcza (14.04.2008), last London Marathon had an unusual course. Six Maasais took part in the competition - this fact would not be unusual, unless they wear their traditional clothes (shuka), where their head their starting numbers fixed. Their kept shields and spears in their hands. As Gazeta Wyborcza informs, the extraordinary runners were collecting money for benefit of their village, which is affected with lack of water. One of them, 24 years old Isaya, summed up their participation in the Marathon in a very colourful way: "Running in London is easy, because there are no lions up there". The Maasais did not win the competition, although it is worth mentioning that the winner was Kenyan, Martin Lel, who passed 42 km of the Marathon with an express time 2:05:15. This was his third victory during last 4 years, and beside of it also third of the best results ever scored in the London Marathon.